Now, this dish isn’t something you’ll find on restaurant menus or on fancy dinner tables — it’s just a little something I whip together whenever I find myself missing home. Singapore, as you may know from travel stories I’ve written as well as my first book, “A Tiger in the Kitchen,” is a hotbed of terrific eats. 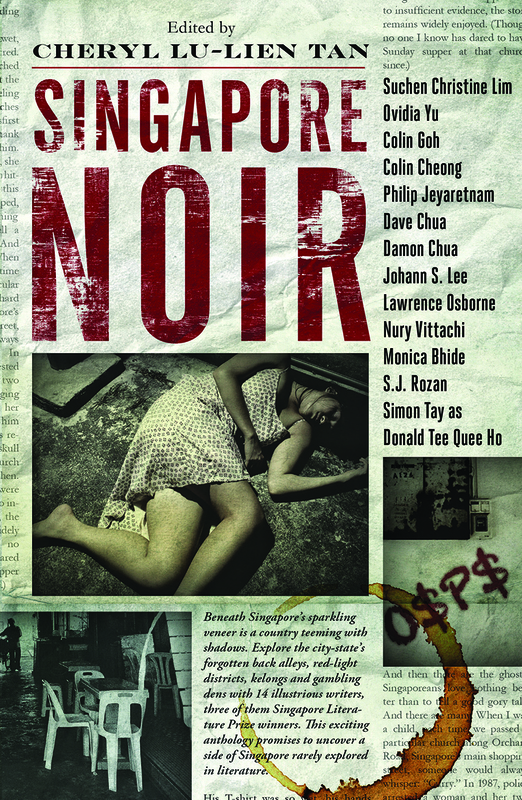 And many of the best places to eat only truly come alive at night — some in Singapore’s various red-light districts. There’s nothing sinister or scary about my dark sauce pork noodles, however — the only thing “noir” about it is the dark soy sauce, black, thick and sweet, that flavors the pork. It’s super easy to make — just fry up minced garlic and shallots, with some preserved radishes, add generous dashes of white pepper, drizzle dark sauce all over that and then toss in minced pork that you’ve marinated for a bit in soy sauce, white pepper and a dash of fish sauce, if you desire. Sinfully good stuff, I tell you. 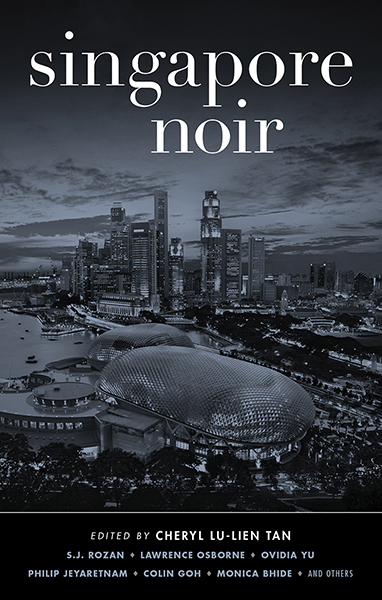 Don’t forget to check out other Let’s Lunchers’ Noir-inspired dishes below! And if you’d like to join Let’s Lunch, go to Twitter and post a message with the hashtag #Letslunch — or, post a comment below. Anne Marie‘s Grifters’ Grinder at Sandwich Surprise! Marinate pork in soy sauce, a dash of sesame oil, a few generous dashes of white pepper, dark soy sauce and a splash of fish sauce, if using, for at least an hour before cooking. Heat up a few tablespoons of corn oil with a dash of sesame oil in a wok over a large flame until the oil is smoking. Add garlic and quickly stir-fry for 30 seconds then add chye poh and shallots, mixing well. Add a few dashes of white pepper and drizzle dark soy sauce and a few splashes of regular soy sauce, mixing well. Fry this mixture until it’s fragrant then add the pork in, breaking it up and mixing it well. While the pork is cooking, cook the noodles in hot water, draining (while saving a cup of the boiling liquid) and rinsing quickly with cold water. Mix the noodles together with sambal, a splash of sesame oil, white pepper, soy sauce and dark sauce and some of the cooking liquid, if the noodles look dry. 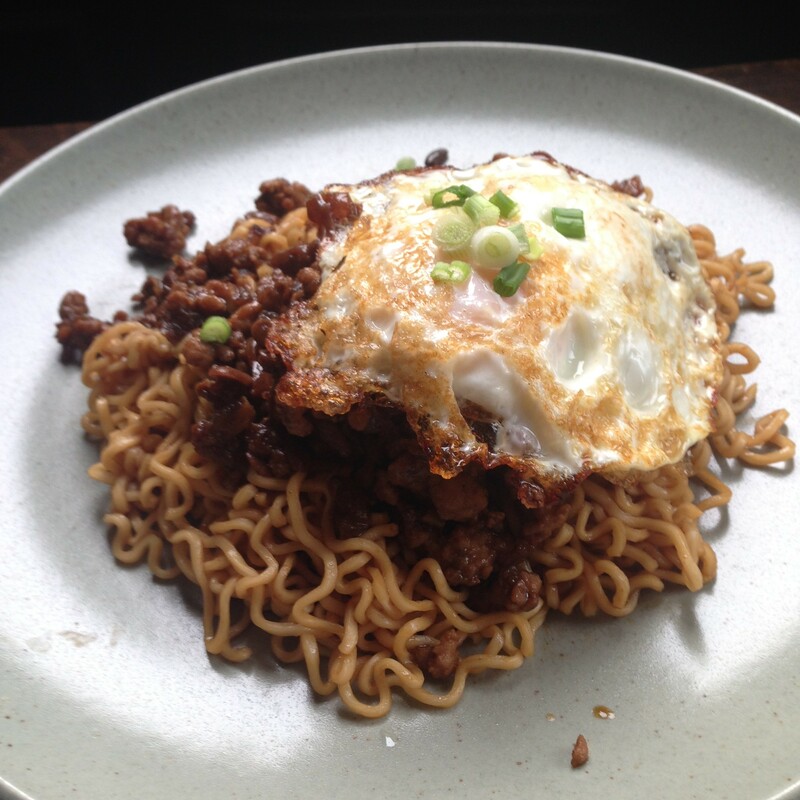 Once the pork is cooked, place it atop the noodles, top that with a fried egg and sprinkle scallions over it. Serve immediately.